Planning a vacation to Yellowstone with young children? You may want to consider spending a day at Yellowstone's Bear World. 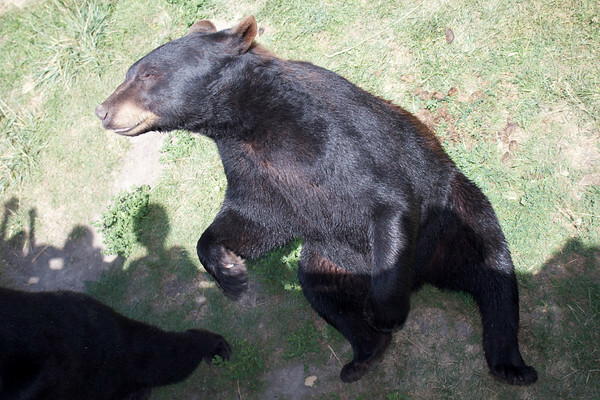 Located near Rexburg, Idaho, Bear World is about a 90 minute drive from the west entrance to Yellowstone. For young children who may be unimpressed with the unique majesty of Yellowstone, Bear World provides a perfect outlet mixing a zoo with a kiddie amusement park. Many Yellowstone tourists are eager to see Moose, Bears, and Wolves when they visit. Unfortunately, few get that privilege and those who do see a bear, may get more than they bargain for. Yellowstone's Bear World allows you to drive through the park grounds where bears and wolves roam freely. From the safety of your car, you are going inside their extensive cage and the bears will come right up to your vehicle. They might even climb onto your car or look through your window. It is quite an experience to drive slowly with a bear 4 inches away through your car window. Grizzly bears are kept behind a fence but easily visible from your car. You are also likely to see a pair of wolves meandering through. Several Deer, Elk, and Bison are also part of your vehicle tour. Fortunately, you can drive through as many times as you like. Another part of the park has animals that can be seen on foot like at a traditional zoo. 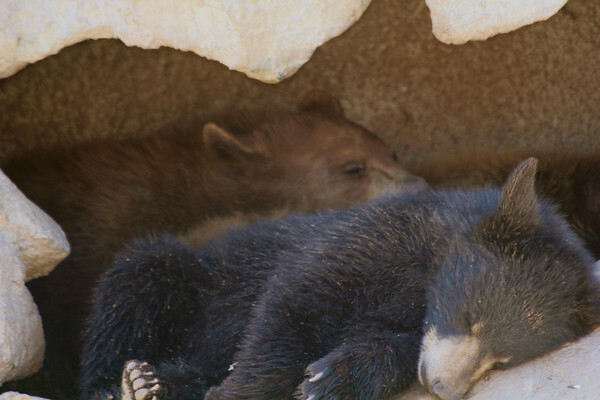 May visitors' favorite exhibit is the baby bears who play in a cave style enclosure. Another enclosure has mountains goats. Nearby is a beautiful deck overlooking a pond which houses the moose (bigger in person than you might think). Next to that is a very impressive petting zoo featuring a large variety of barn animals and frequently baby deer. Our daughter (and me) were absolutely enchanted with petting a deer. Bear World has 5 kiddie rides. 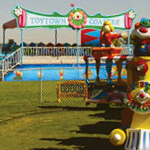 Aimed at very young children, these classic carnival rides generally have little to no line and are certainly nothing unique. However, our then five-year-old considered it one of the best parts of the whole trip. For children who will primarily be seeing nature--both geologic wonders and wildlife, a few rides can go a long way. Parents, beware. Adults can ride the train with their children along a small oval loop and you may be on that train over and over again. Bear World offers a few extras at an additional fee. Visitor can feed the baby bears with a bottle or feed the adult bears from an elevated truck. We decided to go for the adult bear experience. While riding in the back of a large truck, elevated and with rails, a tour guide explains about the various animals in the park including unusual facts about elk, deer, wolves, grizzly bears, black bears, bison, moose, and more. Inside the black bear enclosure, the truck stops multiple times while the tourists toss bits of bread and other food to the adult bears. Some of the bears will perform tricks. Others will eagerly come beg at the truck, barely (or should I say "bearly") out of reach. Despite keeping a very close eye and hand on our then two-year-old son, he did manage to take a bite of the bear bread (stale cinnamon raisin bread) before we could stop him. The guide assured us many a young guest had tasted bear food with no ill effects. The pricing for Yellowstone's Bear World is unique. There are group rates which favor large families. For the price of two adults, our entire family was able to go on the curator tour (feeding the adult bears). However, instead of using the vehicle rate for the main entrance fee, we used coupons because some of our children were young enough to be admitted free. We were traveling through Idaho to reach Yellowstone, so stopping at Bear World was not out of our way. We decided to stop on the way to the park and spend the night in Rexburg. This had a tremendous side benefit. Rexburg motels are significantly cheaper than West Yellowstone or Jackson Hole as are the restaurants. Near our motel was a public park with an impressive splash pad and two kiddie water slides--far better than a traditional motel pool. Free of charge, this park is located at 250 W 2nd St by the Centennial Carousel (the carousel is $1 a ride). Rexburg is a small town and the motel clerk can easily provide you directions. Also, because we were only a 90 minute drive to the west entrance of Yellowstone, we were able to leave the motel early and spend the entire day in Yellowstone Park including exploring some of the trails during the cooler morning hours. If you are trying to save money, you can also leave Yellowstone Park later in the evening on your final day, checking into a motel in Rexburg late. We saved around 50% on our motel (compared to staying in West Yellowstone) using that trick but did not check into our room until about 10:30 p.m. That allowed us to swim the next morning before checking out and still have enough time to drive home. If you have older children or no children, I would not pay to see Bear World. I also would not drive out of my way to see it (especially if you are traveling in and out of the north entrance to Yellowstone). It is simply a cleverly designed zoo with a few kiddie rides. But for younger children, it may be well worth the cost and the stop. Besides, now I can say I have fed a bear.